The Dayton Daily News reports that the Air Force has spent some $567 million to acquire 21 new Spartans since 2007, but has found that the Air Force does not have missions for many of the aircraft. The planes had originally been acquired because of their ability to operate from unimproved runways. But sequestration forced the Air Force to re-think the airplane’s mission, and it determined that they were not a necessity, according to an analyst with the Project for Government Oversight. …An Air Force spokesman said the program was “too near completion” to be able to terminate the program in a way that does not cost the taxpayers more than building the airplanes and sending them immediately to the boneyard. One more thought: the fetishization of (genuinely brave and self-sacrificing) members of the military is cover for sh*t like this. 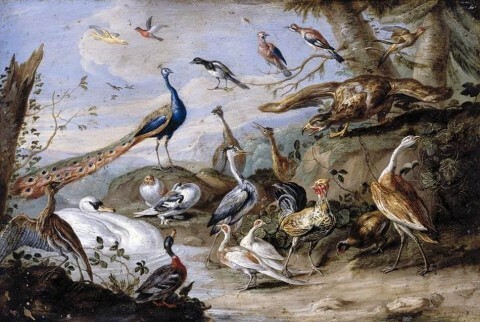 Image: Jan van Kessel, Birds on a Riverbank, 1655. Categories: Decline and Fall, Massive Fail, Military Follies, Who thought that was a good idea?